I woke up feeling very unwell on the morning we were leaving Cambodia for Kuala Lumpur, Malaysia. I felt very lightheaded and had a really bad pain in my chest. Our flight was at 8am and somehow I managed to pack my bag despite the pain and made it to the airport. I was having some difficulties breathing, but I really didn’t want to have to go to the doctor in Cambodia. 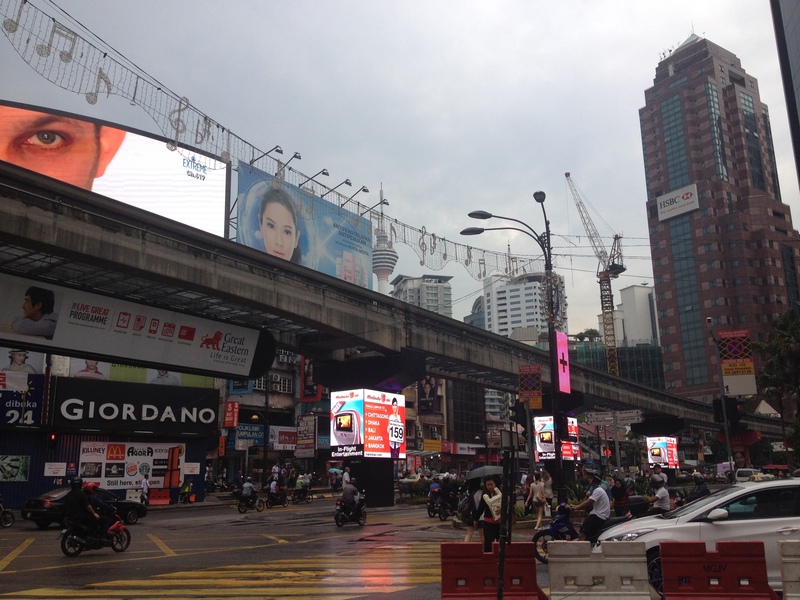 I decided that if the pain hadn’t gone away once we’d reached Kuala Lumpur that I’d go to the doctor there. I was starting to feel better on the plane, but as soon as we’d landed in Kuala Lumpur and we were in the queue for immigration, I was starting to feel much worse and like I needed to see a doctor ASAP. We went to the airport’s medical clinic and the doctor diagnosed me with a respiratory infection, which would explain the intense pain I was having in my chest. I told her that I’d just arrived from Cambodia and she said the high level of air pollution in Cambodia was probably the reason I was feeling so unwell. Cambodia was incredibly dirty – sewage poured into the river, rubbish piled high in the road, rats and dirty nappies everywhere AND all the motorbike fumes – it’s no wonder that I got so sick. The doctor prescribed me some antibiotics and some painkillers and was told to rest for a couple of days, which was a little annoying because we only had 2 days in Kuala Lumpur. After checking into our hostel, we went and got something for lunch, but I didn’t have much appetite (for once) and I only managed a couple of spoons of noodle soup. We then walked around the city for a bit and discovered it pretty much was just skyscrapers and shopping malls. There were even air-conditioned walkways to take you from one shopping mall to the next! It’s great if you had loads of money and wanted to shop, but not so great if you were a backpacker and had no interest in splashing out in Gucci or Louis Vuitton. After Cambodia and the dirty dusty roads, we quite enjoyed being in a big city and feeling like we were back in ‘civilisation’. The following morning I was feeling a little better but not 100%, but we decided to go out anyway and try and see what Kuala Lumpur had to offer. We started off with a trip to the gardens by the Petronas Towers – we wanted to go up to the observation deck but the ticket was an extortionate amount. We decided given how expensive it was and my current condition that the trip wasn’t worth it. It then started pouring it down and we sought shelter in…another shopping mall. The torrential rain didn’t seem to be stopping so we had lunch and went to the cinema. We saw Bad Neighbour and a ticket was pretty cheap compared to England – less than 2 pounds! It was actually quite nice to go to the cinema after travelling for so long. I’m actually starting to miss home a bit now, especially being able to cook my own food. We spend so much time waiting for food in restaurants, I just want to cook my own food for once!! There was an even an M&S Food Hall in the shopping mall selling biscuits, crisps, percy pigs and alcohol. I got so excited when I saw it that I actually bought a pack of shortbread biscuits and they were so yummy. Nom nom nom. I found one shop selling disposable knickers! When we had come out of the cinema the torrential rain had stopped and we went back to the hostel to lie down (I wasn’t feeling too well again). 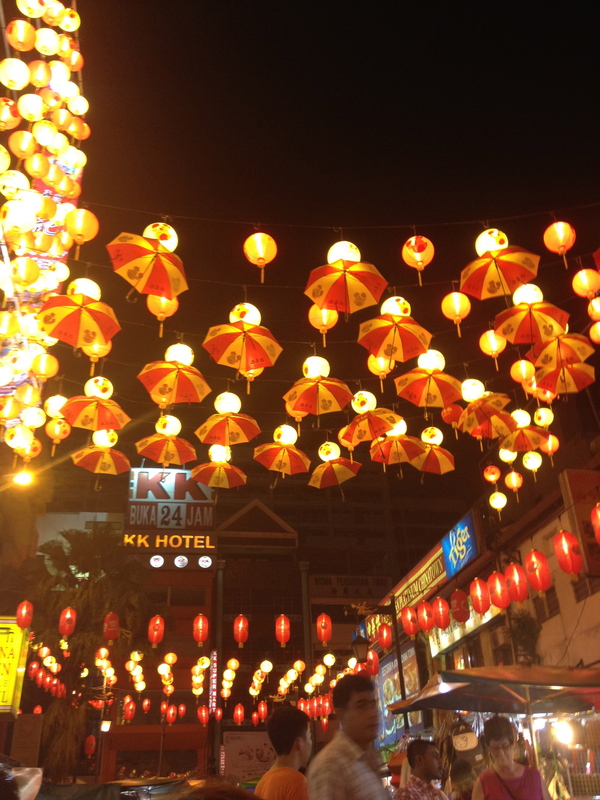 After a little nap we decided to venture out to Kuala Lumpur’s China Town for a spot of dinner. I’m not sure what I was expecting of China Town but it was pretty much just stalls and stalls of fake Rolex watches, designer handbags and the like. There were hundreds of Australian women stocking up on fake designer handbags, and one woman had bought so many bags that she had to chuck them into a black bin bag. Surprisingly there weren’t actually that many Chinese restaurants in China Town, it was mainly just shopping. 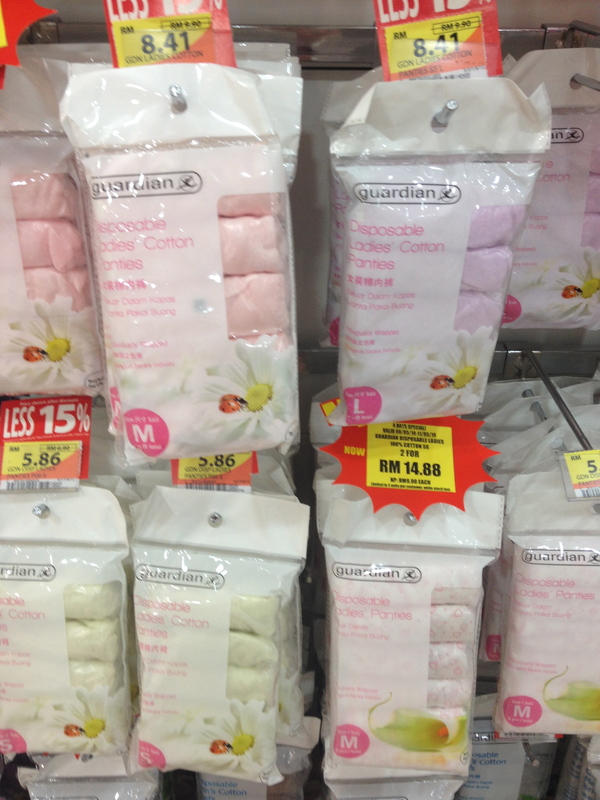 Shopping is pretty much the only thing to do in KL!! 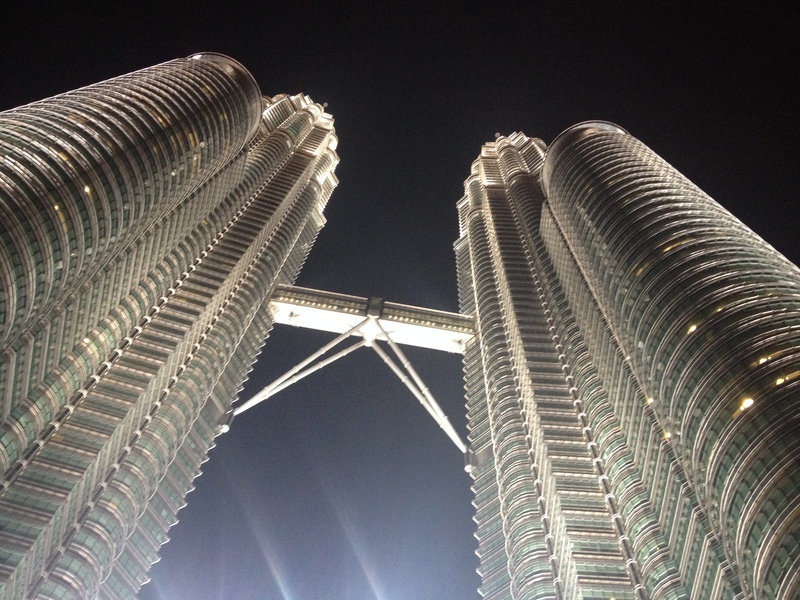 The Petronas Towers at night!